I have just returned from hosting a Wild Eye photographic safari to a place that is cemented more and more firmly as my favourite piece of African wilderness after every visit. I thought of calling this photo "a sense of place", but it could actually only be one place, and that's Mana Pools...hence "a sense of Mana" felt more apt. I don't often get to use my wide-angle lenses in a wildlife context. You have to get really close to the animals, and you have to be able to shift your perspective and composition almost without barriers...and photographing from a vehicle just restricts you in those terms. Being on foot with the wildlife of Mana Pools is a totally different story, though. Many of the elephants are very relaxed around humans if you behave in the appropriate way and approach them in the right way (a qualified guide is recommended). On this afternoon as the sun set in a hazy sky over the Zambezi river, our group was able to get close to a young male as he fed from the pods that are falling from the albida trees at this time of year. I let the landscape photographer in me dictate what I was doing here - working with the starburst of the sun peeping around the edge of the closest tree, and framing wide to provide a sense of context and place. For me, these images speak louder than full-frame portraits of your subject. I like the idea of reducing the animal from the main subject to just one of the elements in a scene that is all about the essence of the place you are visiting...where the sum of the parts is greater than the whole. 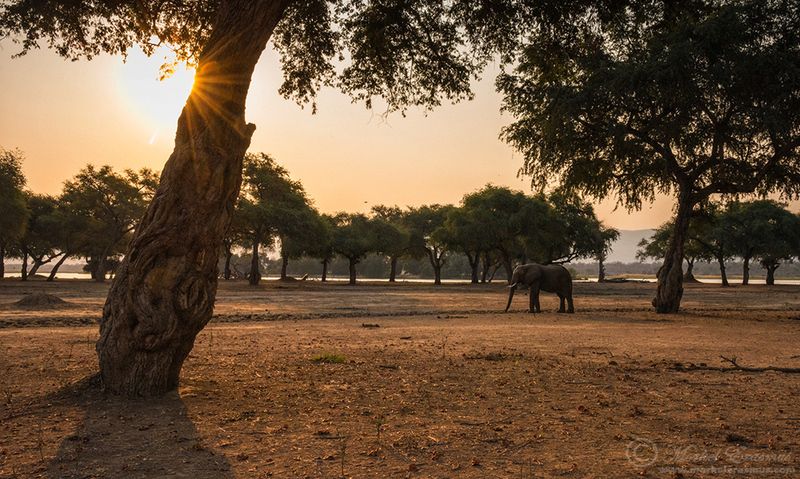 This image is a single exposure, captured while crouching to obtain a lower perspective relative to the earth and the trees, without losing the sense of the Zambezi river in the background. The elephant was quite close, but the focal length belies that in the distortion/perspective. What do you think? Thanks for reading! Have a pleasant day, friends.